[June 20, 2017] KIEV (Reuters) - Ukrainian President Petro Poroshenko will meet U.S. President Donald Trump in Washington on Tuesday for talks on security, political and economic issues, Poroshenko's office said. "It is very important that my meeting, as the Ukrainian president, in the White House will be earlier than (Russian President Vladimir) Putin's meeting," it quoted Poroshenko, who is already in the United States, as saying. It will be their first meeting since Trump took office on Jan. 20. 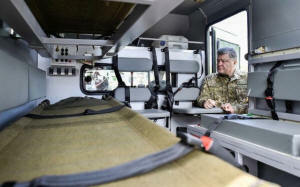 Poroshenko said that he also would meet top officials from the State Department, ministries of defence, trade and energy. Poroshenko praised the U.S. Senate for the decision to introduce new sanctions against Russia, saying that sanctions were a civilized mechanism "to force the aggressor to get away from Ukraine", withdraw troops and equipment. Last week, the U.S. Senate voted overwhelmingly for new sanctions punishing Russia for meddling in the 2016 U.S. election and to force Trump to get Congress' approval before easing any existing sanctions.